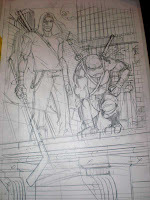 Working on a piece for Tales of the TMNT. Hope you dig it. this is the best news I've heard today! I love your take on Casey. I'm actually writing the issue that's set to appear in! Can't wait!